"A basic brownie recipe that is quick and easy to mix up and calls for ingredients that are usually already on hand." In a large bowl, beat the eggs and vegetable oil together until well blended. Combine the flour, sugar, cocoa powder, baking powder and salt; stir into the egg mixture. Fold in walnuts if desired. Spread evenly into the prepared pan. 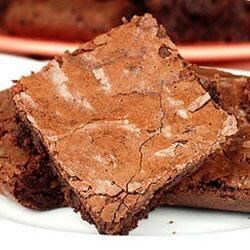 Bake in the preheated oven for 20 to 25 minutes, or until a toothpick inserted into the center of the brownies comes out clean. Allow to cool. Cut into squares. I only used 3/4 cup of oil and 1/2 tsp salt. I added an extra 1/4 of cocoa and 1/2 tsp of vinalla. Thanks to everybody elses comments. Mine turned out perfect!